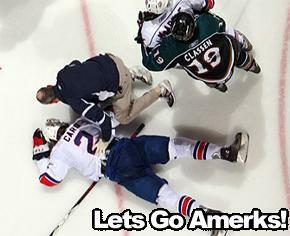 Mancari Saves The Day, Card Injured · Let's Go Amerks! Â With the time winding down to the Amerks entering the record books, this time for longest scoring drought in AHL history, Mark Mancari let go of a shot that broke through for a goal. With that, the Amerks once again avoided being put in the record books for all the wrong reasons.Â Their scoring drought lasted 252:09 until Mancari scored his PP goal at 7:47 of the 3rd period.Â The only team with a longer scoreless stint was a team in New Haven in 1938-39 who went 258:49 without scoring a single goal. Mancari only further proved why it is rediculous that he has been rotting on the forth line while players with half of his skill and experience are getting double shifts. The theme for this season seems to be gettting on the verge of entering the record books but managing to stay out of them. As expected the Amerks were defeated by the Manitoba Moose by the final score of 5-1 in Manitoba.Â The two teams will meet again on Saturday night and we’ll probably experience a similar outcome. In the third period Pierre-Cedric Labrie of the Moose delivered a vicious hit to Mike Card of the Amerks which resulted in every player on the ice throwing punches.Â Mike Card layed motionless on the ice and had to be assisted off.Â He just returned on WednesdayÂ after missing over a month with a concussion.Â He has been diagnosed with a severe consussion and will be missing a lot of time. The Amerks were given seven power play opportunities but only able to capatalize on one of them. Dylan Hunter and Clark MacArthur returned to the Amerks as did Tanner Glass after playing in Florida. Tyler Plante started in goal for the Amerks and made 16 saves, his record with the Amerks fell to 1-6. Franklin MacDonald and Adam Taylor were healthy scratches.Â Andrej Sekera did not make the trip and isn’t expected back on Saturday either. Goals for the Moose were scored by Luc Bourdon (PP), Michael Grabner (2), Juraj Simek, and Brad Moran (PP). The two teams face off again on Saturday night, game time is at 8:30pm EST and can be heard live on Hot Talk 1280 WHTK and live on B2 Networks.Â Based on the way fists were flying in the third tonight we may expect more of the same. Manitoba Moose Recap: Moose Trounce Americans 5-1Â / Link also has pics from the game.